Berghaus says:"The new windproof Primaloft Eco insulated Chulu Jacket is a lightweight and incredibly packable jacket that offers great versatility and is ideal worn on its own or under a waterproof jacket"
This is a really light weight, comfortable jacket. The cut is very flattering (it finishes just at hip level) and the fit true to size - I'm 5'7" and a pretty standard size 12. The sleeve design also permitted a good range of movement. My only gripe is that - for me - the sleeves could have been a tad longer. 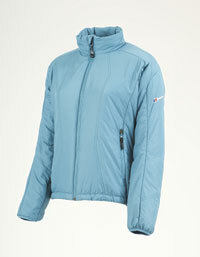 I've worn it on several blustery Autumn days with just a base layer and been very comfortable. The breathability is also good enough to ensure comfort when walking - even at quite a high intensity. There's a good selection of pockets - two decent- sized side (hand-warmer) ones plus a smaller internal zipped security pocket. The front zip has a good sized baffle that goes along the whole length of the full length zip and includes a smooth chin guard. The collar (also with a smooth-finish lining) fiinishes just below chin level. All the zips have decent sized toggles - essential for easy opening with gloved fingers. It washed (albeit at 30 deg) well and dried very quickly. The Chulu is certainly a versatile, extremely lightweight jacket - great for when you need something to quickly get up your body temperature. It's compressible enough to keep at the bottom of you pack just in case. However - that would be a waste because it's good looking enough to wear more generally whenever you need some extra warmth. Nice choice of colours too.